Apple introduced a few new wallpapers in iOS 7. Since the software is only in its first beta, there are only two new static images to choose from. iOS 7 also supports animated wallpapers, and Apple has included two of those to try out. If you’d like to get iOS 7’s hi-res wallpapers on your iPhone right now, then you can download them directly from here and here. A zip file with the static version of the two dynamic wallpapers is also available here. 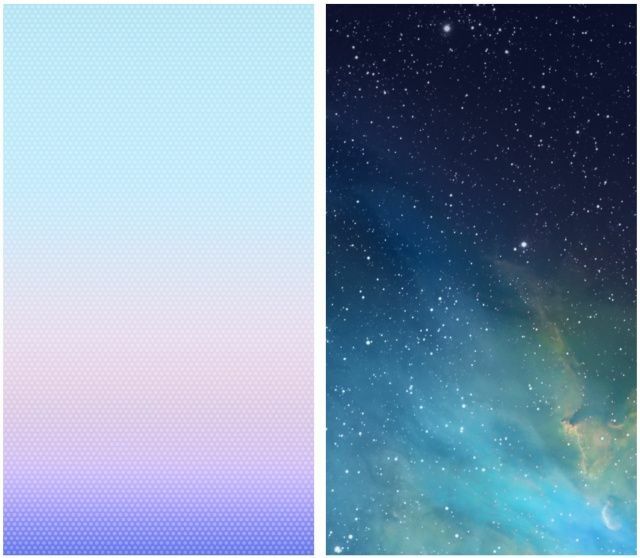 These wallpapers are optimized for the iPhone 5 and 5th-gen iPod touch’s 4-inch Retina display. You can also download Apple’s new OS X Mavericks wallpaper in full resolution for your Mac. It actually looks great cropped on the iPhone’s screen. Another cool feature in iOS 7 is the ability to use panoramic photos as wallpapers. Apple will hopefully add more wallpapers before iOS 7 ships in the fall.